Seniors are more likely to hold home-secured debt, and to hold more of it today than in years past. Their percentage of held debt held has also increased, with seniors aged 75 and up having become four times more likely to hold home-secured debt in 2016 when compared with 1989. The value of debt held by seniors aged 65-74 also grew by 270 percent (in real terms) between 1989 and 2016. 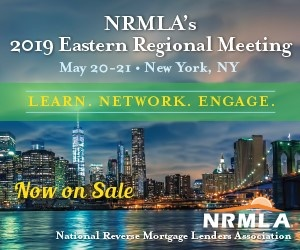 These data points were shared with reverse mortgage professionals by Dr. Eddie Seiler, VP of research and economic analysis at Dworbell, Inc., management company of the National Reverse Mortgage Lenders Association (NRMLA). His presentation was delivered at NRMLA’s Western Regional Meeting in Huntington Beach, Calif. this week. While more closely aimed at laying out the financial realities faced by seniors in today’s economic climate, Seiler also describes how larger economic realities could potentially play into equations that involve senior demographics specifically. One of the major points Seiler makes at the top of his presentation is that people need to look at breaking out delineated generations within the larger bloc of “seniors,” instead of simply lumping them all together as a single demographic. The United States is expected to enter a period of lower economic growth, Seiler says, because of one primary reason: debt. As Americans age, their net worth increases with home equity playing a key role, Seiler says. Median net worth for someone aged 65-69 stands at $193,400. However, when removing home equity from that equation, that same senior’s net worth drops to $66,300. Compounding the issue of seniors’ net worth is a lack of savings, with 55 percent of people aged 55-64 having less than $25,000 in retirement savings, Seiler details. Additionally, household debt has increased in each of the last 18 quarters, and reached a new high of $13.54 trillion in the fourth quarter of 2018. However, this is complicated by a rise in delinquency rates, and student debts are showing increasing levels of delinquency along with auto loans. Recent indications show that a rising number of retirees are being affected by student debt. “We have to keep an eye out on non-mortgage debt: student loans, auto loans and credit card debt,” Seiler says. Seniors are more likely to hold home-secured debt, and to hold more of it compared with 20-30 years ago, Seiler explains. The percentage of debt held has also increased, with seniors aged 75 and older now having become four times more likely to hold home-secured debt in 2016 compared with recorded figures from 1989. More drastically, the value of debt held by seniors aged 65-74 grew by 270 percent in real terms, and by 140 percent for those aged 75 and above over the same time period. While the overall percentage of families with home-secured debt has fallen since 2007, that fall is driven primarily by younger families. Households aged 65-74 have stayed at an elevated level of home-secured debt possession, with a major increase being recorded in 2016 for households aged 75 and older. The underlying factor fueling the rise in senior debt is that their expenses largely exceed their net income, particularly in terms of housing, requiring them to tap savings or other financial resources to make ends meet. Across the three senior generations – baby boomers (born between 1946-1964), the silent generation (born 1928-1945) and the greatest generation (born 1927 and earlier) – housing accounts for the biggest expense making up over 30 percent of seniors’ total spending. Housing expenses increase as seniors age, and take up a greater percentage of income if a senior still holds onto having to make a forward mortgage payment, or if they rent. For some, end-of-life healthcare spending can be very high, and these are all factors that need to be taken into account when attempting to make a sales connection with a potential reverse mortgage borrower, Seiler says. “When building a budget for our borrowers, we need to ensure that no spending categories are overlooked,” Seiler advises. Editor’s Note: A previous version of this article inaccurately referred to Dworbell, Inc. as the ‘parent’ company of the National Reverse Mortgage Lenders Association (NRMLA). RMD regrets the error.